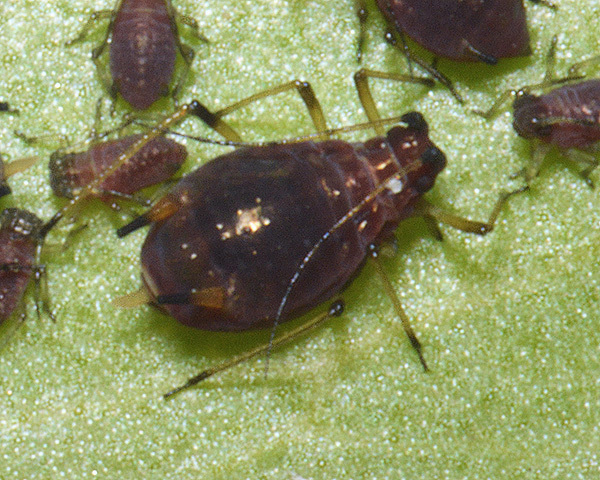 Staticobium are medium to large aphids. The adult viviparae may be winged or wingless. In both Staticobium may be immature or adult. ">apterae and alates the antennal tubercles are broad, low and smooth. Their antennae have a relatively long terminal process with a few rhinaria on segment III. Spiracles are covered by tubercle-like opercula, an adaptation to regular immersion. The siphunculi are more or less cylindrical , tapering, sclerotic and pigmented with reticulation below a small flange. Staticobium aphids are morphologically similar to Macrosiphoniella, but the antesiphuncular sclerites are absent. They are also similar to Sitobion aphids, but the dorsum is not completely sclerotic, pleurospinal sclerites are absent from the alate and the reticulate area on the siphunculus is larger than in Sitobion. Staticobium feed on members of the Plumbaginaceae. They are not visited by ants. The distribution is holarctic with 12 species worldwide. Adult apterae of Staticobium staticis are dirty green or dirty red (see pictures below of red form). The antennal segments I and II and the tips of the antennae, knees, tips of tibiae and tarsi are dark. The antennae are 0.6-0.9 times the body length. Short blunt body hairs are placed on small, dark scleroites. The siphunculi are black with pale bases and are 1.1-1.4 times the length of the cauda. The body length of Staticobium staticis is 2.4-2.7 mm. Staticobium staticis alates are green or red with rather distinct marginal sclerites and well developed postsiphuncular sclerites. The siphunculi and cauda are thinner than in the aptera. The oviparae are dark brown with a reddish anterior. The apterous males of Staticobium staticis are green or olive with brown spots around their siphuncular bases. 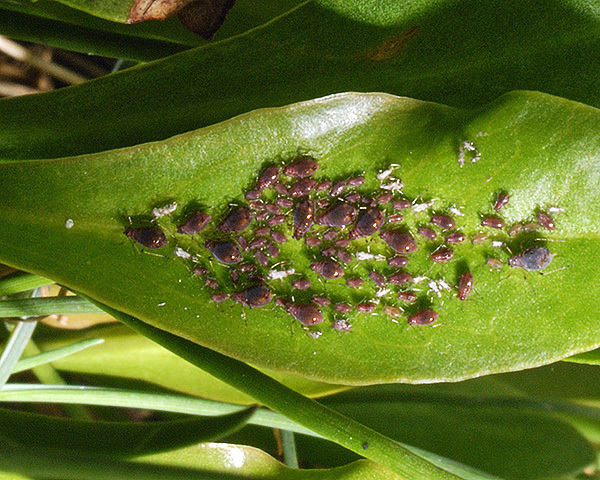 The sea lavender aphid does not host alternate. It feeds on the leaf blades and upper parts of the stem under the flowers of common sea lavender (Limonium vulgare) and lax-flowered sea-lavender (Limonium humile). Staticobium staticis is found around the coasts of northern and western Europe.